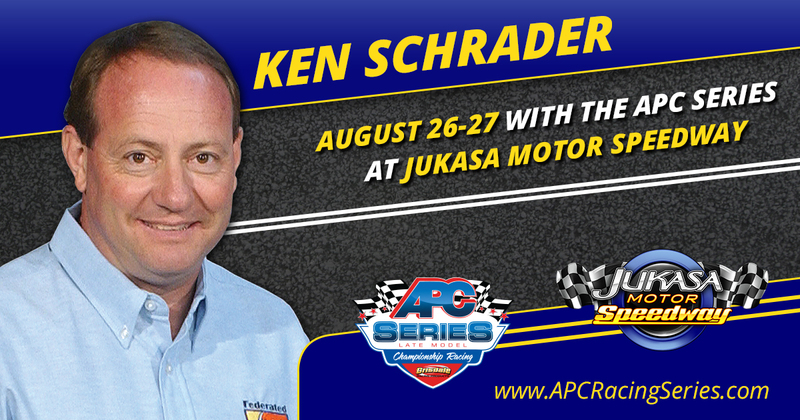 The APC Series, in association with Jukasa Motor Speedway, are proud to announce that during the August 26th & 27th grand reopening former NASCAR star and racing legend Ken Schrader will be on hand fielding an entry prepared by Shaw Motorsports. Ken Schrader, a veteran of nearly 30 years in the NASCAR Cup series, has multiple Cup victories to his name to go along with nearly 50 years of racing experience in almost every type of race car under the sun. These days Ken can be found racing his dirt modified frequently throughout the racing season across various parts of North America. Although Schrader prominently focuses his attention to his dirt racing program he stillgets behind the wheel of asphalt race cars, and succeeds when doing so. “In May we ran the little 500 sprint car race at Anderson Speedway in Indiana that was my last asphalt race, 500 Laps is no small deal. We also run the late model a few times a year so I don’t think it is going to be much of an adjustment. Just the reopening of thetrack is going to be a lot of fun,” noted Schrader when asked about his last time driving an asphalt race. Schrader recorded a top 10 finish in the 33 car field at the Anderson, Indiana facility. Jukasa Motor Speedway, formerly known as Cayuga Motor Speedway, is known as Canada’s crown jewel. The facility has sat dormant for several years now, but under new ownership and management the speedway has been reborn again, with no expenses sparred. The speedway has seen an overhaul to the racing surface, pit area, lighting, and more. The facility has seen many big names come through the gates before but having Ken Schrader on hand for the tracks rebirth will be special. “There have [been] so many legends pass through these gates so anytime we haveone come back it is very exciting and to have a fan favourite like Kenny return is special,” says Alex Nagy, Jukasa Motor Speedway general manager. Earlier in Schrader’s career he actually visited the speedway twice, running two separate events. The APC Series, in its third year of competition, has seen rapid growth and is developing into one of Canada’s top racing series. The Series will run a different format for the first time in its 3 year existence, running twin 75 lap main events after what is sure to be an exciting practice and qualifying night the day before. The series is expecting a very large field of cars to attempt to qualify forone of the coveted starting spots in the main show. With the current talent in the APC Series, adding Schrader to that will only amplify it. Jukasa Motor Speedway management and APC Series officials, drivers, partners and fans are excited and eager for August 26th-27th. The 5/8 Mile track reopening is big for Ontario auto racing and with the addition of Ken Schrader to the roster it only amplifies the level of excitement and buzz surrounding the event. Schrader is a fan favourite and legend of racing that will surely make a bid for the win. “Come in and have some fun, but it’s a lot more fun if you win. We are coming up to race,” added legendary driver Ken Schrader when asked about his expectations for the Twin 75 lap races. Ken Schrader Twitter: @KenSchrader Facebook: Ken Schrader Racing Inc.